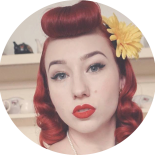 Hello lovelies, today I have for you the next glamorous edition of Vintage Tea With Me Series where I’m sitting down and chatting with the incredible Kenjai, burlesque dancer and boss babe behind Kustom Klaws! Kustom Klaws is a nail salon specialising in decadent custom nail services. Kenjai and I are chatting about all things nails and looking at ways you can improve your own nail health, if acrylics are bad for you, and so much more. We’re even answering some questions Kenjai asked her fans what they’d like to know about nails. Kustom Klaws open their new salon in May of 2019 in an opulent pink building custom created by Kenjai! They’ll be location 1004 Beaufort Inglewood and will be hosting a launch event with proceeds going to Cat Haven, I’ll be going so I hope to see you there too. Don’t forget to support your local pinup businesses. Be sure to subscribe to my channel to never miss out on a glamorous video! This entry was posted on March 23, 2019 by Miss Lady Lace in Pinup, Videos, vintage tea with me, YouTube and tagged 1940's, 1950's, blogger, glamour, miss lady lace, miss lady laces pinup blog, perth, perth pinup, perth pinup blog, perth pinup community, pin up, pinup, pinup blog, pinup blogger, pinup fashion, pinup girl, pinup life, pinup lifestyle, pinup perth, red lips, retro blog, retro girl, retro glamour, the perth pinup community, victory rolls, vintage, vintage blog, vintage blogger, vintage fashion, vintage girl, vintage glamour, vintage perth, vintage pinup blog.